In around 1860, Kirriemuir Parochial Board erected a small almshouse at the south of Kirriemuir, at the north side of Muirhead Road, what is now Beechwood Place. In 1913, the establishment was registered as a statutory poorhouse with the central Board of Supervision. It then had an official capacity of 34 inmates. 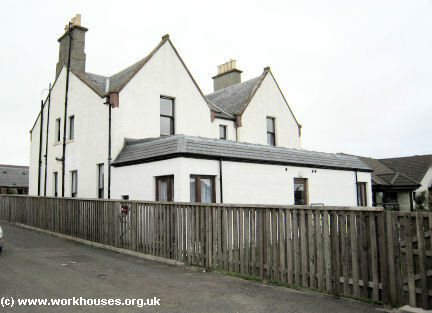 Kirriemuir former almshouse/poorhouse from the south-east, 2009. After 1930, it was known as Buckie House Poor Law Institution. In 1946, it had 15 beds, some of which were used for accommodating chronic sick patients. The premises, now known as Beechie House, operate as a guest house.